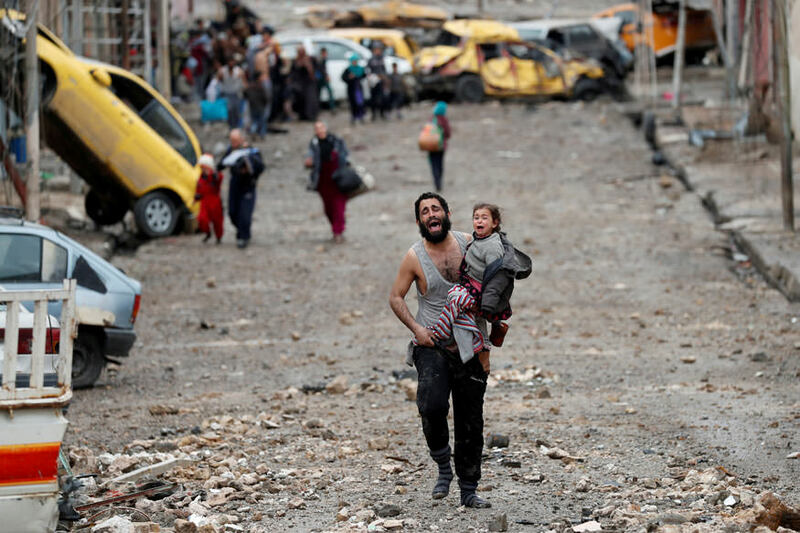 A man cries as he carries his daughter while walking from an Islamic State-controlled part of Mosul towards Iraqi special forces soldiers during a battle in Mosul, Iraq. Goran Tomasevic: "Both screaming in terror, a father and the young daughter he cradled in his arm fled through the rubble-strewn streets of Wadi Hajar, transformed in a flash into a battleground between Islamic State fighters and Iraqi special forces. They and their neighbours - some wearing rubber sandals, some barefoot - were running from an IS counter-attack in this part of Mosul, dodging gunfire as the militants closed in. When they reached the special forces lines, males were ordered to lift their shirts to prove they weren't suicide bombers. Some had to take off their clothes or show their belts, though not those carrying children. The father was so beside himself, so panicked. It was obvious because he had a short shirt on and was carrying a child that he wasn't Islamic State." Flames and smoke billow as firefighters deal with a fire in the Grenfell Tower apartment block in West London. Toby Melville: "The phone rang at around 3.30 in the morning. "What's happened," I said, on autopilot as I emerged from deep sleep. My picture editor, Dylan, only calls at that time of night for breaking news. 'It's not terror,' said Dylan. I felt a sense of relief. He said a tower block in West London was on fire. I dressed, picked up my cameras, laptops and phones and jumped into the car. It was still dark at 4 a.m. when I got to the scene. I could see a tower block ablaze. I was shocked. There must be scores of people trapped inside and the fire had started at 1 a.m., the worst possible time with so many residents at home and asleep. I felt the clock ticking as I searched for a parking spot close enough to get there on foot. As I got closer, I thought about accessing the neighbouring tower blocks that were yet to be cordoned off. 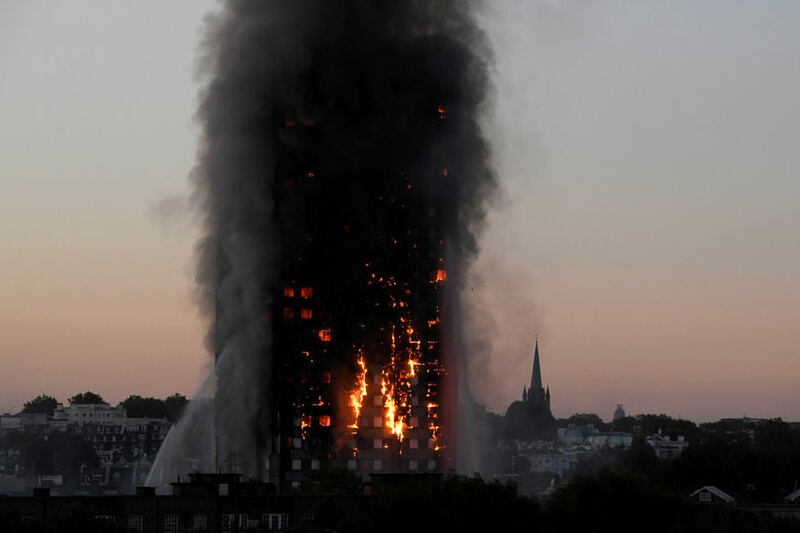 I couldn't help thinking that if the structure had been ablaze for some three hours the building would collapse in smoke and rubble. It would be unwise to get too close. The crackling of little explosions coming from the building and the muted noise of sirens. Ash was falling around me onto the road. This picture has a church in the background. I shot wide frames of the building on what would otherwise have been a beautiful summer dawn." A medic holds the body Ayah Muhammad Mansour recovered from under the rubble of a house destroyed by a Saudi-led air strike in Sanaa, Yemen. Khaled Abdullah: "Early in the morning of August 25 I rushed to the site of an airstrike in Sanaa where first responders were beginning to pull out bodies from the ruins of a flattened building. The body of Ayah Muhammad Mansour, 7, was recovered, blood and dust covering her face and head. "She is dead," shouted a medic, as people at the site cried, swore and prayed. The bodies of her siblings were then recovered. Only one sister, Buthaina, aged 4 or 5, survived, with her skull fractured. Twelve civilians were killed in that strike, including Aya and eight of her family members. As I was taking pictures, I tried my best to curb an urge to cry. Among the first responders was an uncle of Aya's, Saleh Muhammad Saad. He kept shouting to the people who gathered at the scene to be quiet, so that the rescuers could hear voices of the victims under the ruin of broken concrete blocks and wooden planks. "I could hear the shouts of one of their (Aya's family) neighbours from under the rubble, and tried to remove the rubble from on top of Muhammad (Aya's father) and his wife, but I couldn't. They died," Saleh said. 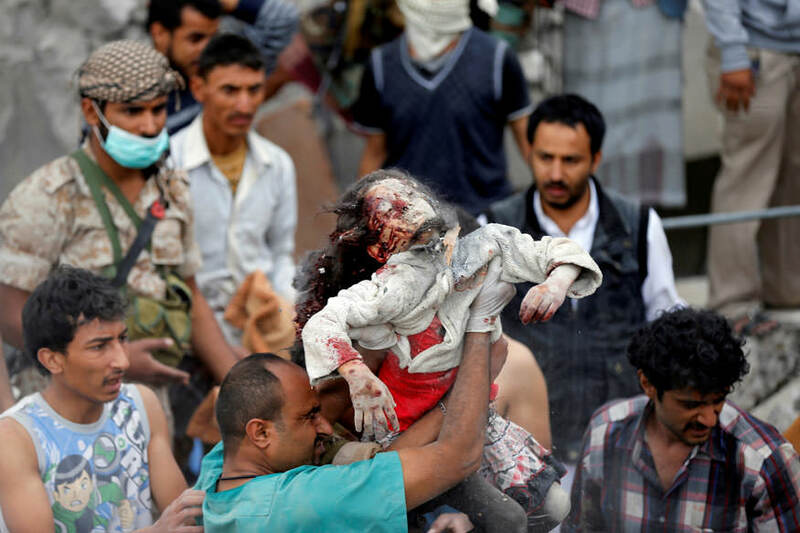 "We lifted the rubble and saw first her brother Ammar, who was 3, and her four sisters, all of them dead. I paused a little and just screamed out from the pain. But I pulled myself together, got back there and then heard Buthaina calling." Covering the grief and agony of this family, and the tragic loss of so many as a result of this man-made catastrophe that my country is going through, made me more determined to convey the picture of what the war is doing to people." A man takes a ride on a police wrecker following the G20 summit, in the Schanze district of Hamburg, Germany. Kai Pfaffenbach: "The G20 summit in Hamburg in July kept a large crew of Reuters photographers busy for three days. The German government took extreme measures against protests and demonstrations. For the first time in many years, German special police forces armed with assault rifles were deployed to secure areas where protesters were setting up burning barricades, stopping traffic and looting shops. On the last evening of the summit, everything seemed to have calmed down, so the Reuters photographers decided to have some pizza for supper at the Rote Flora, the "headquarters" of the left-wing protesters in Hamburg. There was no violence - no riots. All was calm, until suddenly I saw something. I pointed it out to my colleagues: police water cannons were coming again! Everybody laughed and thought I was kidding. But within seconds I had left my pizza and beer, grabbed my cameras and ran towards the water cannons which had already started firing. In Germany, such cannons are often accompanied by armoured bulldozers to clear barricades and one of these was stopped by a lone protester. The young man was holding tight to the bulldozer's mechanical shovel but also clutching his bottle of beer. 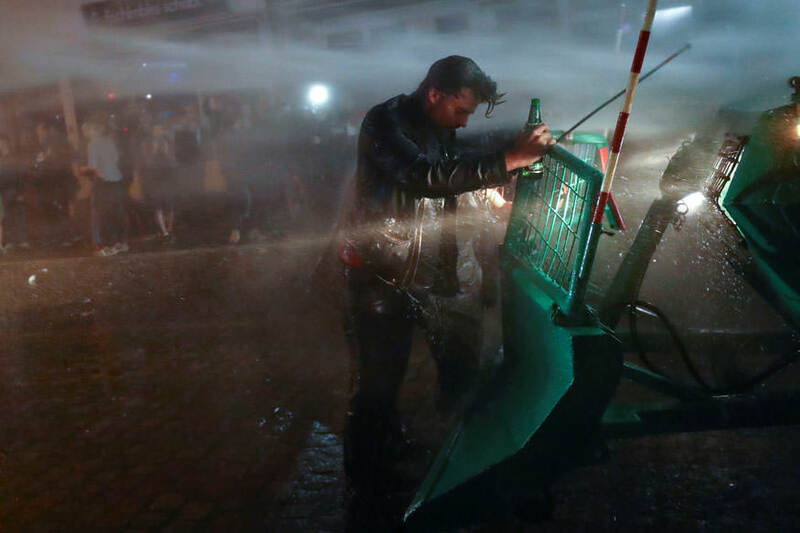 All the while he was getting soaked by the water cannon's rear gun. Even so, he didn't let go and even the bulldozer's driver seemed to smile behind his bulletproof glass. The guy got big cheers from the crowd until a group of riot police dispersed them all with a heavy dose of pepper spray. It hit me as well, so I went back to my pizza and beer." Photographers help a Rohingya refugee to come out of Nad River as they cross the Myanmar-Bangladesh border in Palong Khali, near Cox's Bazar, Bangladesh. Hannah McKay: "We were standing, looking out over paddy fields and grasslands - lots of water and one thin path leading to the border with Myanmar. In the distance, we could see a huge group of people. But they weren't moving. It was 4 o'clock in the afternoon with only two hours of daylight left. So we decided to move towards them. It took us about an hour along the muddy path, meeting border guards and persuading them to let us pass. The crowd was sitting on a riverbank and behind them, about three metres below, in the river itself, there were just hundreds of refugees coming across every minute. It was non-stop. There was no end to the people. People carrying babies. Elderly people being escorted through the water and mud, more than knee-deep. And we were just photographing everyone coming towards us. Then this woman appeared. She got to the point where she needed to get up to the footpath where we were. But she was exhausted. Two refugee men on her level were trying to push her up, which was when we reached out to help. Reuters photographer, Adnan Abidi, took a hand. Another photographer took another and I got her leg when she got within range. It was a case of dragging her. She lay there for a few minutes. I have no idea what happened to her. You are there trying to do your job with a camera in your hand. And then your heart overrules your head." 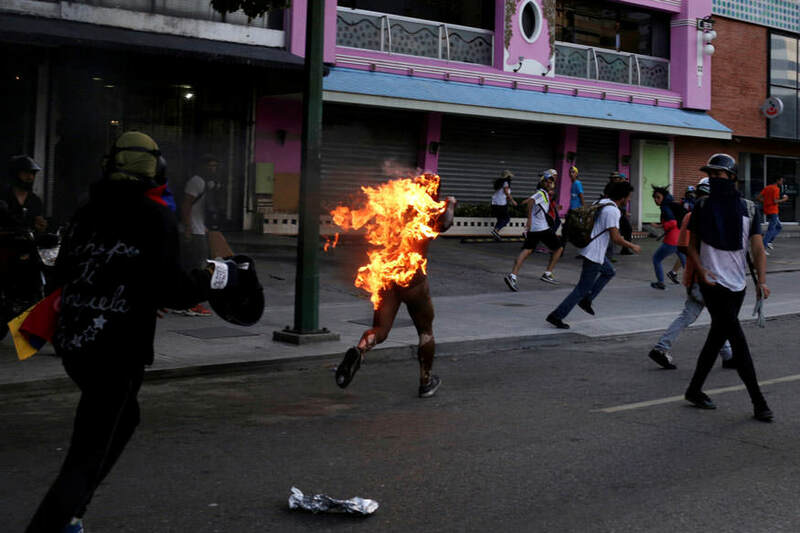 A man who was set on fire by people accusing him of stealing during a rally against Venezuela's President Nicolas Maduro runs amidst opposition supporters in Caracas, Venezuela. Marco Bello: "I spotted a man running in front of me as a group of protesters, most of them hooded and with makeshift shields, were chasing him so I followed them. Some 100 meters down the street, the protesters caught the man and surrounded him. When I walked up and went through the circle of people to take pictures, someone had already poured gasoline over the man and set him on fire. The government said that the man was set on fire for being "Chavista" (a follower of Venezuela's late President Hugo Chavez), but all I heard throughout was that he was being accused of trying to steal from a woman. I didn't hear anyone accusing him of being a pro-government infiltrator. The mob was crazy, you cannot reason with them, they do not think. Later, when things calmed down, I thought, 'This is mad'. I was just taking pictures and thinking about the technical aspect of my shooting. It's how I deal with shocking situations that are happening in front of me. Orlando Figuera, 22, passed away two weeks later." 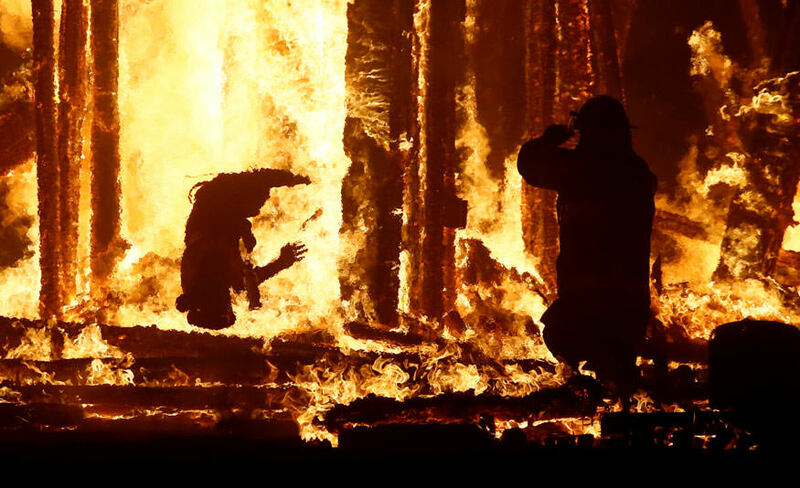 A burning man participant evades a chasing firefighter and falls into the flames of "The Man" burn at the annual Burning Man arts and music festival in the Black Rock Desert of Nevada. Jim Bourg: "It was 10:30 at night in the Black Rock Desert and tens of thousands of people were gathered in a huge circle to watch the effigy of "The Man" burn at the culmination of Burning Man 2017. I was located approximately 200 feet from the effigy, and the heat from the flames was very intense. Suddenly, off to my right I heard screams and yells and saw Burning Man security and firefighters chasing a man running through the darkness towards the flames. I had just a moment to decide whether to expose for the likely tackle as they brought him down in the dark or spin my camera to the flames in case he actually made it to the fire. Knowing that the image and event would be far more significant if the runner made it to the flames I exposed for and focused on them as 41-year-old Aaron Joel Mitchell ran into the inferno with a firefighter trying to stop him. Mitchell ran back and forth through the burning embers and then appeared to either trip or dive into the flames. The lens gave me a horrific close up view as the man struggled and reacted to the flames consuming him. Multiple firefighters ran into the flames and braved the threat of the falling structure to finally succeed in carrying him out. Mitchell was airlifted to a hospital in Northern California but died later that night. It was a horrible and troubling end to what is always an amazing week and coverage." 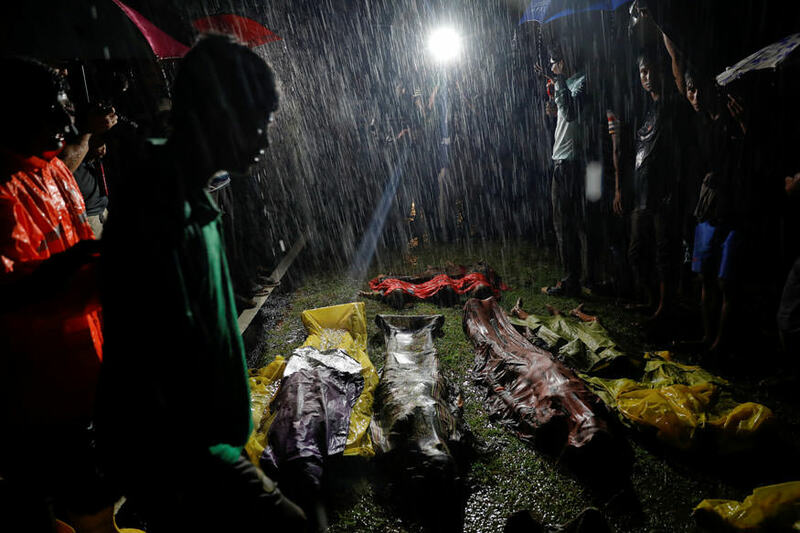 People gather under heavy rain around bodies of Rohingya refugees after their boat with passengers fleeing from Myanmar capsized off the Inani beach near Cox's Bazar, Bangladesh. Damir Sagolj: "September 28 was a day of heavy rain and big waves. I was in southern Bangladesh to cover Rohingya Muslims landing in rickety boats after a dangerous sea journey from Myanmar. As I drove along Marine Drive, a beach road between the towns of Cox's Bazar and Teknaf, I thought no boatman would risk sailing in such conditions. What I didn't know was that a single doomed boat had been lost at sea overnight and was slowly making its way to shore. Just after sunset, I learned the boat carrying 80 Rohingya had capsized at Inani beach near my hotel. There were many casualties. I made it to the beach in ten minutes. The relentless rain and chaotic scenes made it difficult to find out what happened. I counted 15 bodies lying on the road near the beach. They were partially covered by plastic sheets and soggy pieces of cloth. Lalu Miya, a Rohingya survivor who I would later meet for several days to reconstruct their deadly journey, was identifying the bodies of his wife and four-year-old son. That same night more bodies were collected from the beach. In the morning, survivors and local residents gathered for a funeral. 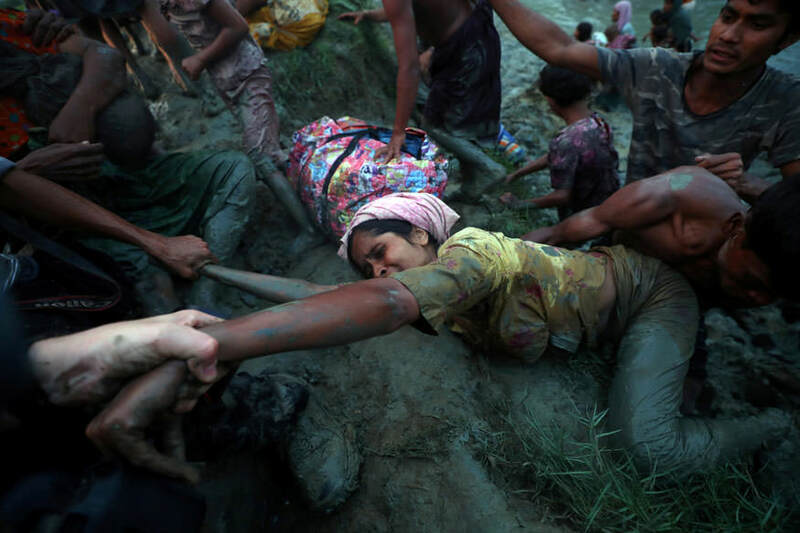 The 23 dead were buried in two mass graves in rice fields behind one of the most beautiful beaches in Bangladesh. Most of them were children." 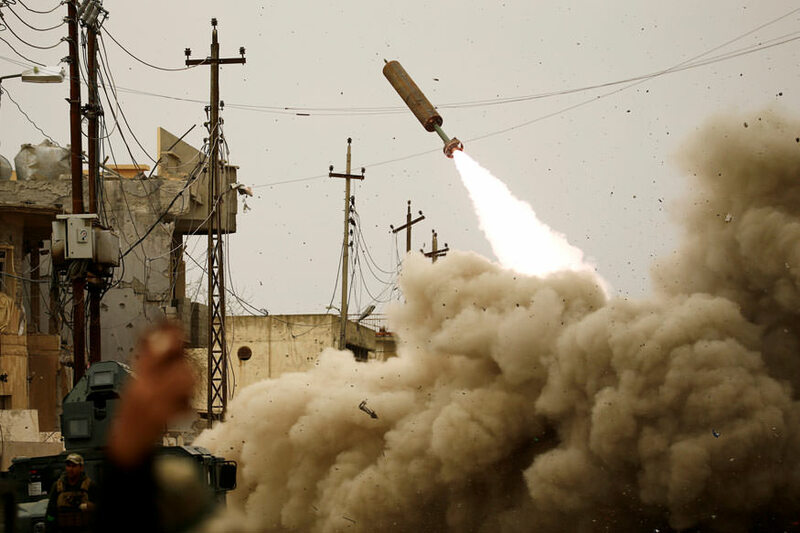 Iraqi rapid response members fire a missile against Islamic State militants during a battle with the militants in Mosul, Iraq. Thaier Al-Sudani: "This attack came in the middle of a battle when Iraqi forces were trying to recapture the regional government compound from Islamic State. I was taking pictures of clashes at Mosul's antiquities museum when we spotted an Islamic State drone in the air above us. We dropped to the ground for fear of being attacked by a rocket. I cut my hand and we returned to the car to treat it. When we got there, I saw Iraqi forces firing rockets nearby at an IS target beyond our field of vision, so I resumed taking photographs. I thought this photo was a strong one that expressed the terrible violence of battle. It is another world covering wars compared with news conferences. There is 100 percent danger, and the internet we need to transmit pictures is poor or non-existent." 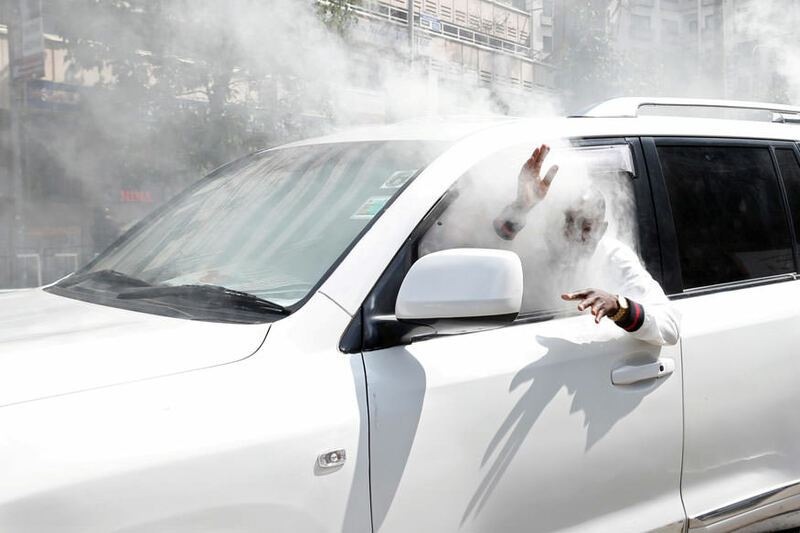 Caleb Amisi Luyai an opposition politician of the National Super Alliance (NASA) coalition, reacts after a gas canister fired by policemen hits his car during a protest along a street in Nairobi, Kenya. Baz Ratner: "I was lucky to get this picture. I was covering an opposition protest with Thomas Mukoya, the chief photographer for East Africa. I was riding a motorbike ahead of a convoy going to Nairobi's main street in defiance of a government ban on rallies in city centres. Suddenly, I heard the crack of teargas being fired by riot police. The police were stationed at almost every intersection to block the protesters. I pulled over to put on my gas mask and saw that one of the canisters had landed inside a nearby car. A man was leaning out the window choking on fumes and frantically trying to get out. The gas was so thick he couldn't see anything. As I ran to help open the door I managed to take a few photos. I didn't recognise the man but Thomas Mukoya later identified him as an opposition MP Caleb Amisi Luyai. Opposition protests were almost a daily occurrence during Kenya's long election season and police often disperse them with teargas or live rounds. Sometimes civilians were caught. Two days before I took the photos of the MP I saw a teargas canister land in a crowded bus. A woman was so desperate to escape she climbed out of the vehicle's back window." 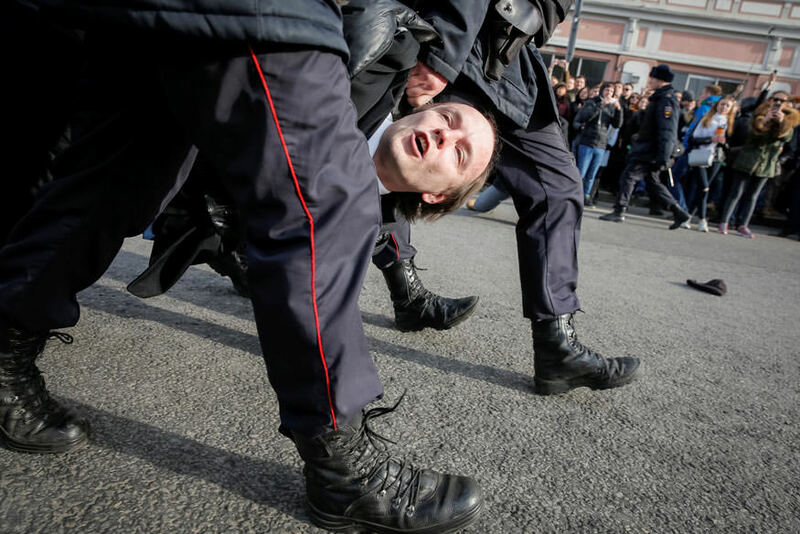 Law enforcement officers detain an opposition supporter during a rally in Moscow, Russia. Maxim Shemetov: "This picture was taken during protests in central Moscow, organised by opposition leader Alexey Navalny. I was in Pushkinskaya Square, which was flooded with people, shouting slogans and waving flags. Traffic stopped and the police started detaining people. I saw police officers holding a protester by his arms and legs. He was shouting, and his head was just between their boots. I shot some frames almost from ground level while running beside them. I didn't look into my camera. I was just thinking: "Let my picture be sharp! Let it be sharp!" The next day it was on the front page of the New York Times." 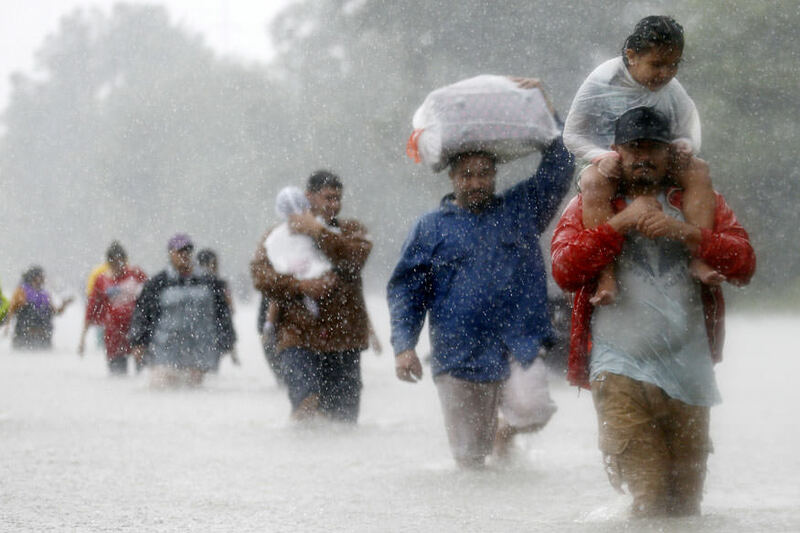 Residents wade through flood waters from Tropical Storm Harvey in Beaumont Place, Houston, Texas. Jonathan Bachman: "It was my first day covering Hurricane Harvey. I only made it 500 yards into Houston when I came across a staging area where ordinary people were conducting water rescues in the Beaumont Place neighbourhood of Houston, Texax. In addition to the rescues, residents were able to walk against the current down a long road which is seen in the image. At first I went out on a boat with a couple from Louisiana to help and document several rescues. When we got back, I looked down the road and saw an almost perfect line of residents making the long walk to the staging area. I intentionally moved to a position so I could photograph them in a way that would convey the magnitude of this storm. I wanted to communicate that it was a never-ending line of residents struggling to get to safety and it would go on for days. Harvey was a very difficult and emotionally taxing assignment. My first instinct was to put down the camera and help. It is always hard to come to the realisation that I am most helpful when I am taking pictures. As an observer of suffering you have to believe that your images can make a difference." Palestinians react following tear gas that was shot by Israeli forces after Friday prayer on a street outside Jerusalem's Old city. 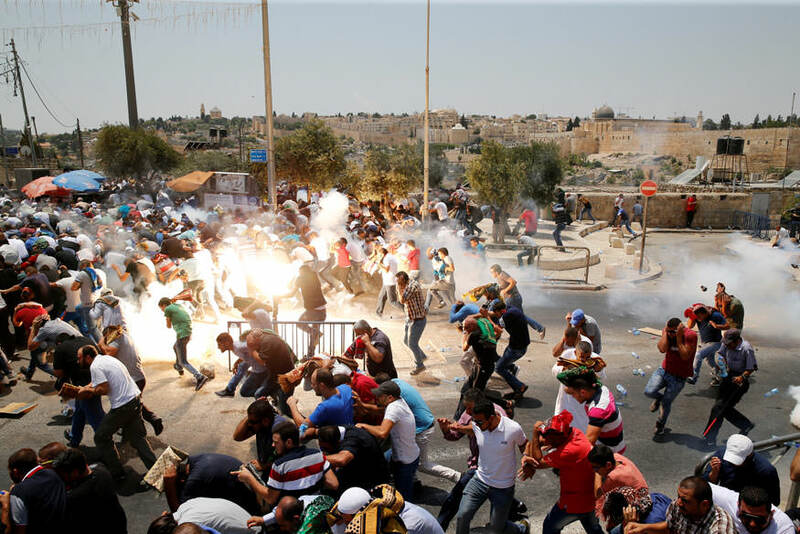 Ammar Awad: "One Friday, Muslim elders called for a Palestinian "Day of Rage" to protest Israeli security measures at Jerusalem's holiest site. I'm a native of Jerusalem and have covered the city for Reuters for 17 years, so I knew that Ras al-Amud, directly across the valley from the walled Old City, would be my best vantage point because the al-Aqsa Mosque and the golden Dome of the Rock dominate the landscape. I arrived at the scene and the first thing I heard was an Israeli officer giving orders to his forces to disperse the crowd the moment Friday prayers ended. 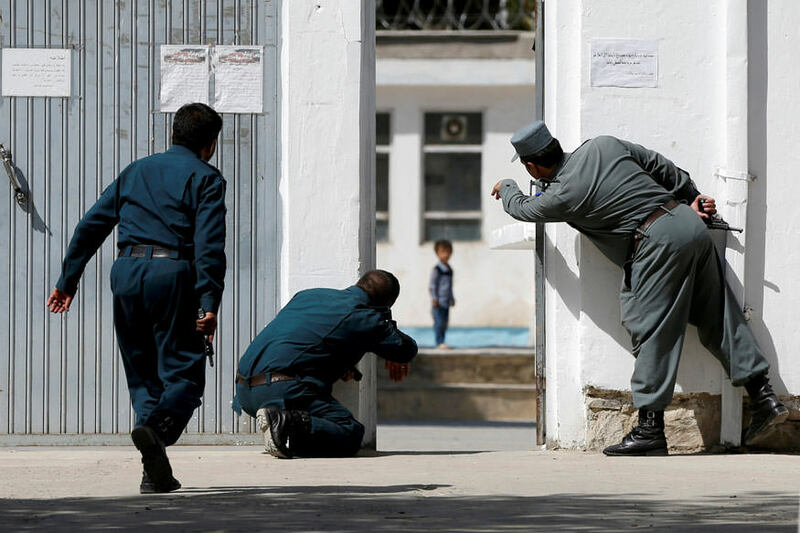 Seconds later, sound bombs erupted and many of the Muslim worshippers who had been praying started to run. Others were just finishing their prayers as the scene turned to chaos. It's hard to describe the sound bombs. They are so loud it is as though the whole area must have been destroyed. I took 20 frames as an Israeli tear gas canister was unleashed on the crowd. The light from the exploding projectile lit up the scene, highlighting the colours in an unnatural way. Scores of men cowered instinctively from the deafening boom. I delivered the photo directly from my camera to the desk knowing that it told the unfolding story. I had a feeling that it would be the photo of the day." 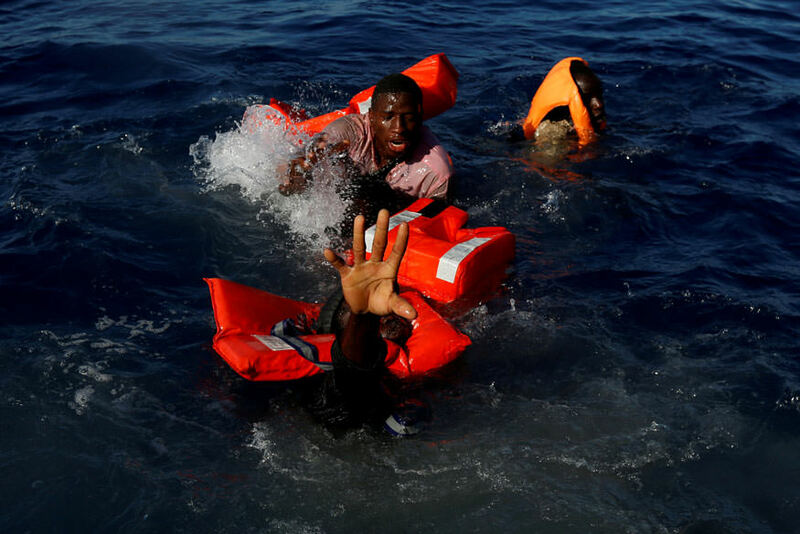 Migrants try to stay afloat after falling off their rubber dinghy during a rescue operation by the Malta-based NGO Migrant Offshore Aid Station (MOAS) ship in the central Mediterranean in international waters some 15 nautical miles off the coast of Zawiya in Libya. All 134 sub-Saharan migrants survived and were rescued by MOAS. Darrin Zammit Lupi: "I spent five weeks with the Migrant Offshore Aid Station (MOAS) on their ship, Phoenix, covering search and rescue operations in the Mediterranean. At the start of the Easter weekend we were on a routine rescue around 15 nautical miles off the Libyan coast. I was on the MOAS fast rubber boat with crew members handing out life jackets to a group of 134 Sub-Saharan migrants on a flimsy dinghy before we would transfer them to the Phoenix. I had one camera up to my eye to shoot some wide angle frames. Suddenly, one migrant balancing on the rim of a dinghy slipped sideways and like dominos several of his colleagues lost their balance and fell into the sea. I captured the whole sequence by keeping my finger on the shutter button. It was chaos. I kept shooting as the rescuers leapt into action, helping several of the migrants pull themselves onto our boat. I was grabbing hold of people with one hand and shooting with the other. Then, through my viewfinder, a few metres away, I noticed one man struggling more than the others, stretching out his arm towards us. I screamed to alert our specialist rescue swimmer that one man was going under. He reacted instantly, jumped in, and pulled the man to safety. Afterwards, I did a lot of soul searching. Should I have put down my cameras altogether and just grabbed hold of whoever I could? That evening I discussed it with the rescuers, who felt I'd done the right thing. Their job was to rescue lives. Mine was to document the harsh reality of what's happening. Everyone survived that day." A woman assists an injured person after an incident on Westminster Bridge in London, Britain, March 22, 2017. Toby Melville: "I was on the footpath below the southeast end of the bridge, shooting pictures for the on-going Brexit story. I saw in my peripheral vision a large dark shape around 3-5 metres away come over the parapet and hit the ground approximately 10 metres below. I thought it was a terrible but isolated accident. I immediately called for an ambulance and ran to the top of the steps to try to get help at St Thomas's, the nearby hospital. While on the phone, I saw a couple more people lying on the pavement amongst debris, covered in blood or unconscious. There were other people scattered along the bridge and pavement in various states of injury and distress. I realised this was not an accident but something premeditated. As the emergency services were on the scene now, I started taking photos along the bridge. I was unsure if danger was still present. I didn't know a car had been driven into these people. I hadn't heard any screams, loud engine noises or the gunshots of the armed police shooting and killing the perpetrator of the attack, Khalid Masood. I thought the injured or dead might also have been shot and a gunman might still be on the loose. Armed police arrived and cleared the bridge. I called the office and started filing photographs from the back of the camera, transmitting most of the frames I had shot for the office to choose, edit and crop. A week later I walked back over the bridge, everything was 'back to normal', in a way. But the sight of the first victim falling and the sickening thud as he hit the pavement still goes through my mind. I wonder whether I should have transmitted all the frames I shot. The sequence of pictures is hard to look at. I remind myself I was lucky. I had walked over the bridge about a minute before the attack. Others weren't so fortunate." 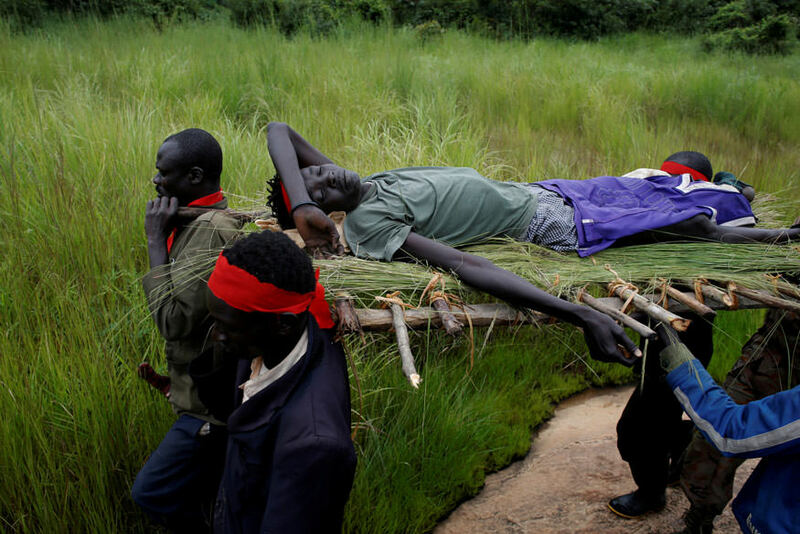 SPLA-IO (SPLA-In Opposition) rebels carry an injured rebel after an assault on government SPLA (Sudan People's Liberation Army) soldiers, on the road between Kaya and Yondu, South Sudan. Goran Tomasevic: "This picture shows how the rebels lacked supplies to treat their wounded. They didn't even have a stretcher or bandages. This wounded rebel was in severe pain and I had to give him painkillers from my own supply. When rebels attacked the town of Kaya they distributed the few items they had to their men: a ragged strip of red cloth to serve as identification, a packet of biscuits and two ammunition clips per fighter. They ran out of bullets in 40 minutes and government forces counter-attacked, killing several people including American journalist Christopher Allen. Working in South Sudan requires commitment. On that trip, my colleague Siegfried and I crossed several rivers on foot. We worried about falling and getting our equipment wet. To minimise the risk, I distributed two cameras to two rebels and carried the third myself. It was unlikely all three of us would fall into the water. On our way back to the Ugandan border we traveled by motorbike. It rained heavily and the small streams became rivers. The drivers carried the motorbikes on their heads, balancing on underwater 'bridges' that were actually fallen trees. We carried our gear at head height to prevent them getting wet. Water came up to our chests. I also worried about crocodiles but thankfully I didn't see any. One night, we walked in single file through elephant grass in complete darkness. The grass rose above our heads. When we lay down on the ground to rest, it was so cold I started shaking. On the way back, we ran out of water and I couldn't find my chlorine tablets. We had to drink from swamps, streams and boreholes. Thankfully, nobody got too sick." 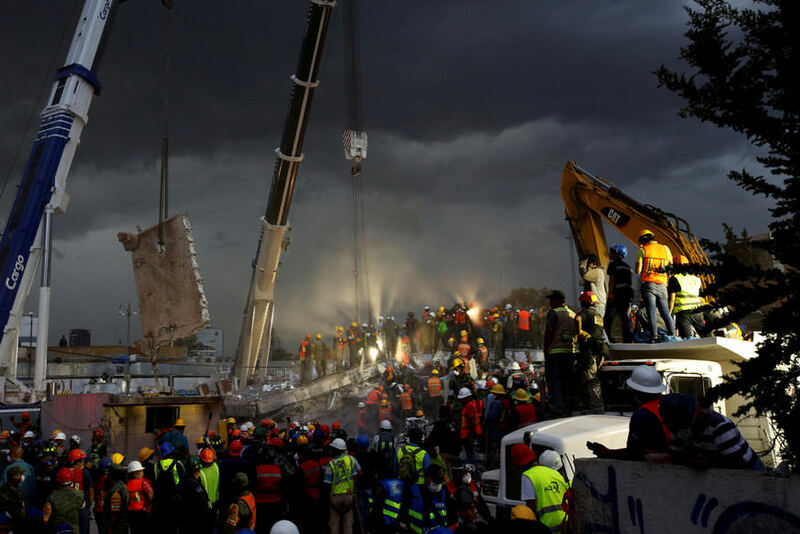 Rescue workers and Mexican soldiers take part in a rescue operation at a collapsed building after an earthquake at the Obrera neighbourhood in Mexico City, Mexico. Carlos Jasso: "I took this photo of rescue workers, soldiers, volunteers and residents trying to retrieve a corpse from the rubble the day after the Sept. 20 earthquake in Mexico City. The atmosphere was extremely emotional as everyone was shocked by their own experiences of the earthquake but desperate to help find people. Everyone was focused on the rescue - removing rubble, moving tractors, making silent gestures in case they could hear voices, bringing food and handing out water. Within the chaos there seemed to be organisation. I got to the front of the rescue scene by accident, I started walking into the chaos and seemed to pass all security, police and army. The feeling I had when I was taking this photo was hope that they would find someone in the rubble alive. My responsibility as a photographer is to portray what is happening and I feel this image portrays the effort, hope, sadness and pain within a community after a natural disaster. When the earthquake happened I was on one of the main streets of downtown Mexico City. I was totally shocked when the ground shook so violently. On the one hand I wanted to continue taking photos and on the other I desperately wanted to get through to my wife on the phone and see my daughter. So I tried to do both - take photos while making my way to my daughter's school. It was mayhem; buildings had collapsed, cars were abandoned on the street, people were wandering injured and shocked, there were screams about gas leaks... children from the nursery were lined up in cots on the street. Finally I was united with my daughter and wife and then I was able to carry on working." 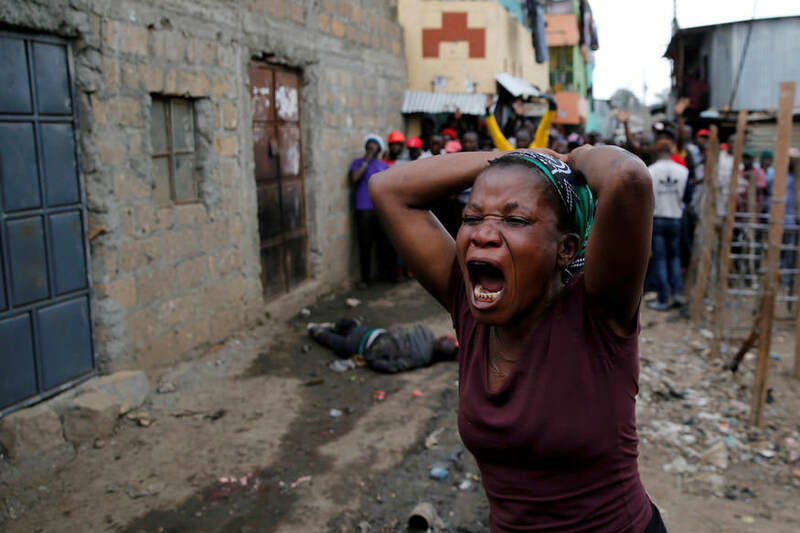 A woman gestures as she mourns the death of a protester in Mathare, in Nairobi, Kenya. Thomas Mukoya: "After the August 8 election, Kenyan opposition leader Raila Odinga called a late-night news conference at which he claimed the tallying of results was flawed. This picture was taken the next morning in his volatile Mathare slums stronghold, one of the most dangerous places in Kenya. After hours of running battles between riot police and opposition supporters infiltrated by gangs of muggers, the riot police changed tack. At about 3.30 p.m. a group of youthful protestors attempted to re-erect a barricade that had just been cleared on Juja Road near the air force headquarters. Riot police charged to repulse them, a few shots were fired and the police left the scene immediately. Two protesters were shot. Because of the muggers, it was dangerous as a photographer to access the alley, where there were casualties, children screaming, and women mourning. One of those killed - by a shot to the head - was Bernard Okoth Odoyo, 25, whose auntie mourned uncontrollably near his lifeless body. I spent about 10 minutes taking pictures and withdrew when the crowd started becoming hostile. I chose to tell the story of the killing by focusing on the wailing auntie of the deceased. Further clashes in the Mathare slums saw protesters detained, roads blocked and several houses destroyed. Taking these pictures was a rare opportunity to show post-election violence starting even before the President-elect was named. Covering conflict, you have to stay alert and understand the environment you are operating in because things happen very fast and you have to act quickly and calmly. Safety comes first. In this case, the mourning auntie was a moment to tell the story."